. : Farm Forest Line :. Many federal, state and local laws and regulations, relate to farm forestry. In fact commercial tree growing is one of the most regulated farming activities. It is often the responsibility of each landowner, contractor or investor to make themselves aware of the relevant regulations and make the appropriate applications. The federal government is responsible for taxation law. A number of recent taxation rulings are directly related to farm forestry including: rules related to investments in revegetation for land protection, the sale of standing forests, tax averaging, primary production status for tree growers and afforestation schemes. Some state governments have also passed legislation that separates the ownership of trees and land for the purpose of facilitating commercial arrangements between landowners and off-farm investors. The role of local government authorities varies widely across Australia. In most cases they are responsible for land use planning and may require landowners to obtain a permit prior to establishing or harvesting trees. Landowners and investors are encouraged to contact their local government authorities in order to find out if and what approvals may be required. Many international conventions, federal government polices and state initiatives are relevant to farm forestry. 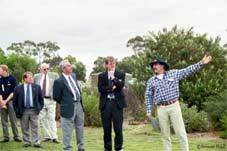 For example, the international conventions on biodiversity and climate change have led to a number of federal and state initiatives supporting revegetation. Many national and state policies on forestry, sustainable development and plantation development are also directly related to programs that seek to influence revegetation and farm forestry. Many federal, state and local government programs provide support and assistance for landowners. Cost-share grants are available in most states for projects considered to have off-site environmental, social or economic value. Other government programs provide assistance for education, extension, regional planning and information of other initiatives by state agencies, non-government organization or community groups.